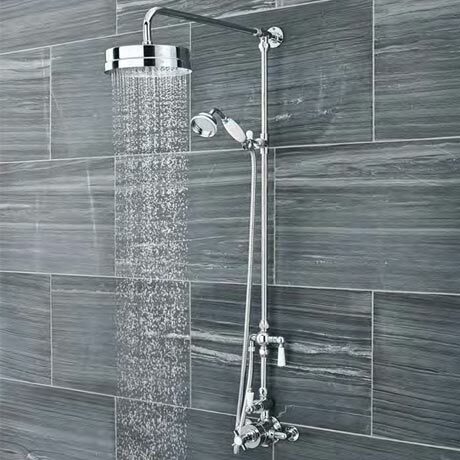 A classic Luxury Rigid Riser Kit with Exposed shower valve. Complete the look of your bathroom with a Designer rigid riser shower kit. It has a built-in diverter so you can switch between the fixed head or hand held shower. All kits comprise of exposed pipe work including a sliding rail, shower hose and shower head. Combined with the supplied exposed shower valve this rigid riser shower kit will enhance the appearance of any bathroom. This Exposed Thermostatic Twin Shower Valve offers thermostatic showering via two easy-to-operate controls. The Traditional twin thermostatic shower valve is robust and graceful and this strength of design is equaled by the depth of choice of shower heads & kits. Suitable for all types of plumbing.